論文#2 Circulation. 2006 Mar 14;113(10):1353-60. 論文#3 J Pharmacol Sci. 2005 Aug;98(4):372-9. 論文#4 Hypertens Res. 2005 May;28(5):447-55. 論文#5 Circ Res. 2003 Oct 31;93(9):874-83. 論文#6 J Am Soc Nephrol. 2003 Mar;14(3):584-92. 論文#8 Circ Res. 1998 Oct 5;83(7):752-60. Calcium channel blockers, more than diuretics, enhance vascular protective effects of angiotensin receptor blockers in salt-loaded hypertensive rats. Advanced glycation end products activate a chymase-dependent angiotensin II-generating pathway in diabetic complications. J Pharmacol Sci. 2005 Aug;98(4):372-9. Beneficial effect of candesartan on rat diastolic heart failure. Excess aldosterone under normal salt diet induces cardiac hypertrophy and infiltration via oxidative stress. Circ Res. 2003 Oct 31;93(9):874-83. 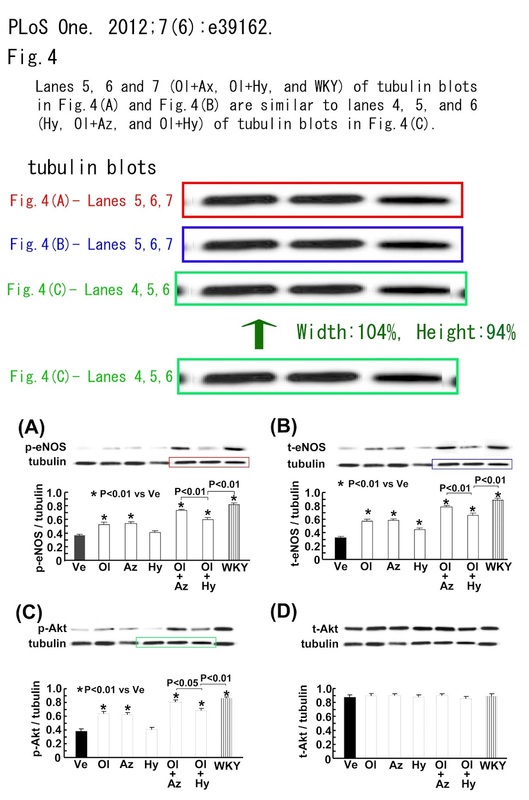 Apoptosis signal-regulating kinase 1 plays a pivotal role in angiotensin II-induced cardiac hypertrophy and remodeling. J Am Soc Nephrol. 2003 Mar;14(3):584-92. Differential contribution of three mitogen-activated protein kinases to PDGF-BB-induced mesangial cell proliferation and gene expression. Important role of angiotensin II-mediated c-Jun NH(2)-terminal kinase activation in cardiac hypertrophy in hypertensive rats. Circ Res. 1998 Oct 5;83(7):752-60. Differential activation of cardiac c-jun amino-terminal kinase and extracellular signal-regulated kinase in angiotensin II-mediated hypertension. Cardiac mitogen-activated protein kinase activities are chronically increased in stroke-prone hypertensive rats. Eur Heart J. 2009 Oct;30(20):2461-9. doi: 10.1093/eurheartj/ehp363. Epub 2009 Aug 31. Effects of valsartan on morbidity and mortality in uncontrolled hypertensive patients with high cardiovascular risks: KYOTO HEART Study. "This article has been retracted by the journal. 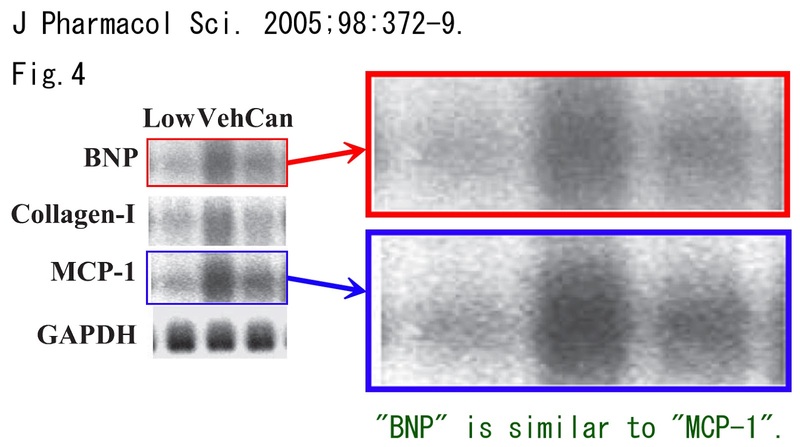 Critical problems existed with some of the data reported in the above paper. The editors of the European Heart Journal hereby retract this paper and discourage citations of it." collection, data analysis, data interpretation, or writing of the report. J Hum Hypertens. 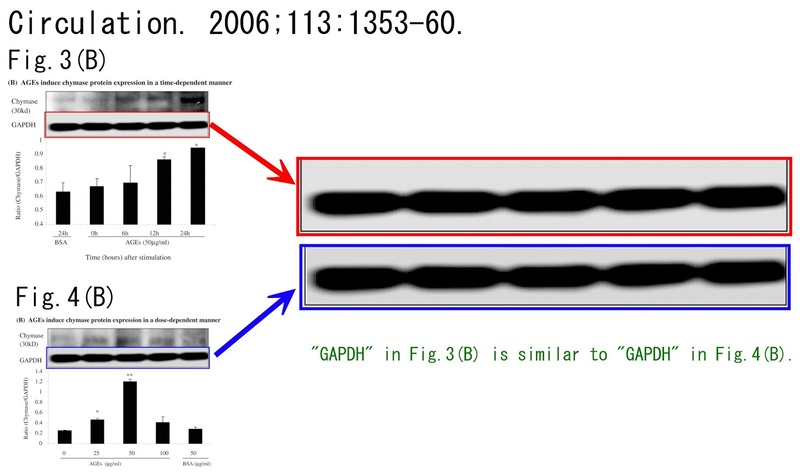 2009 Mar;23(3):188-95. doi: 10.1038/jhh.2008.116. Epub 2008 Sep 18. Rationale and design of the KYOTO HEART study: effects of valsartan on morbidity and mortality in uncontrolledhypertensive patients with high risk of cardiovascular events. Sawada T, Takahashi T, Yamada H, Dahlöf B, Matsubara H; KYOTO HEART Study Group. Matsubara H （松原弘明）, Dahlöf B, Sawada T, Shirayama T, Mori Y, Okigaki M, Matsumuro A, Yamada H, Tsutsumi Y, Matoba M, Takahashi T,Shiraishi H, Ikeda K, Nakamura T, Yamada T, Hirano S, Azuma A, Kimura S, Sasaki S, Shiga K, Maki K, Furukawa K, Okuda S, Kajita Y,Nishio M, Kohno Y, Kitamura M, Nishida K, Yamahara Y, Nakamura T, Sawada S, Sakai R, Kuriyama T, Miyanaga H, Kitani T, Haruyama H, Nishio A, Kinoshita N, Inagaki S, Sugihara H, Katamura M, Hachiya T, Kato S, Ohtsuki K, Higaki J, Kim-Mitsuyama S (光山勝慶), Ichiki T, Kitakaze M, Sugiura T, Rakugi H, Yagi K, Kanda K, Sakakura C, Shirahasi N (白橋伸雄), Miki M, Toyoda S.
PLoS One. 2012;7(6):e39162. doi: 10.1371/journal.pone.0039162. Epub 2012 Jun 14. Yamamoto E, Kataoka K, Dong YF, Koibuchi N, Toyama K, Sueta D, Katayama T, Yasuda O, Ogawa H, Kim-Mitsuyama S.
Department of Pharmacology and Molecular Therapeutics, Kumamoto University Graduate School of Medical Sciences, Kumamoto, Japan. 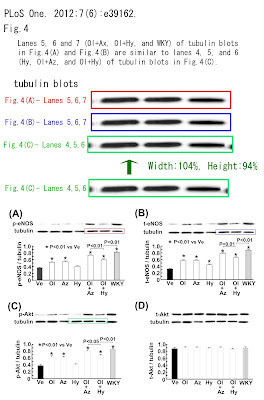 and lanes 5, 6 and 7 (Ol+Ax, Ol+Hy, and WKY) of tubulin blots in Fig.4(A) and Fig.4(B) are similar to lanes 4, 5, and 6 (Hy, Ol+Az, and Ol+Hy) of tubulin blots in Fig.4(C). 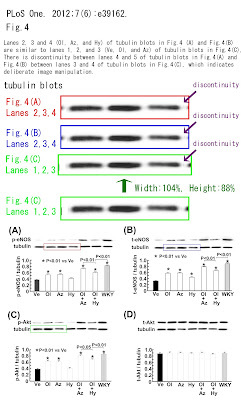 There is discontinuity between lanes 4 and 5 of tubulin blots in Fig.4(A) and Fig.4(B) between lanes 3 and 4 of tubulin blots in Fig.4(C), which indicates deliberate image manipulation. 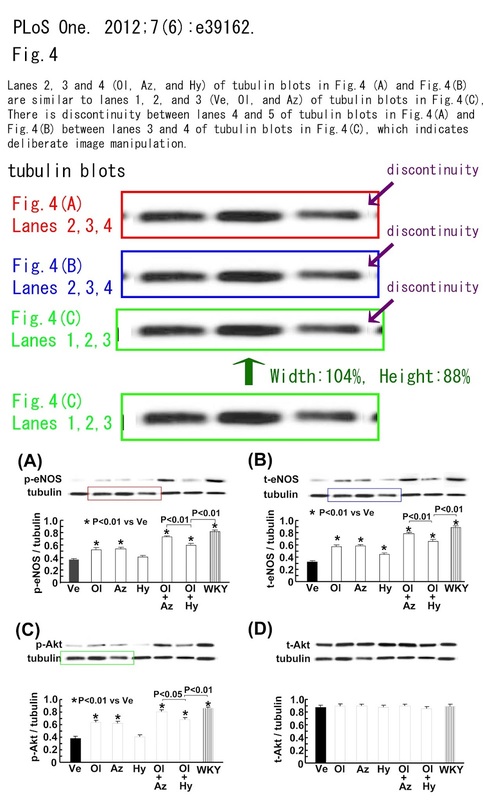 Lanes 2, 3, 4, 5, 6, and 7 (Ol, Az, Hy, Ol+Ax, Ol+Hy, and WKY) of tubulin blots in Fig.4(A) and Fig.4(B) are similar to lanes 1, 2, 3, 4, 5, and 6 (Ve, Ol, Az, Hy, Ol+Az, and Ol+Hy) of tubulin blots in Fig.4(D) and Fig.5(B). Circulation. 2006 Mar 14;113(10):1353-60. Epub 2006 Mar 6. Koka V, Wang W, Huang XR, Kim-Mitsuyama S, Truong LD, Lan HY. Department of Medicine-Nephrology, Baylor College of Medicine, Houston, TX 77030, USA. 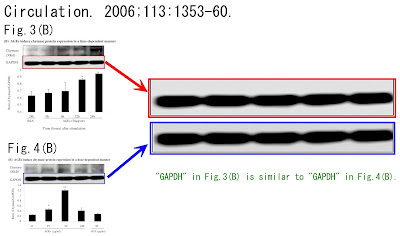 "GAPDH" in Fig.3(B) is similar to "GAPDH" in Fig.4(B). J Pharmacol Sci. 2005 Aug;98(4):372-9. Epub 2005 Jul 29. Wake R, Kim-Mitsuyama S, Izumi Y, Yoshida K, Izumiya Y, Yukimura T, Shiota M, Yoshiyama M, Yoshikawa J, Iwao H.
Department of Pharmacology, Osaka City University Graduate School of Medical Sciences, Osaka 545-8585, Japan. 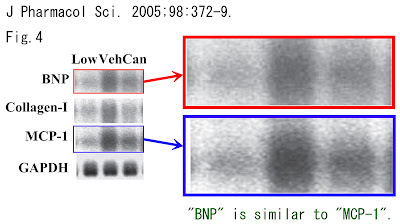 Fig.4 - "BNP" is similar to "MCP-1". Yoshida K, Kim-Mitsuyama S, Wake R, Izumiya Y, Izumi Y, Yukimura T, Ueda M, Yoshiyama M, Iwao H.
Department of Pharmacology, Osaka City University Graduate School of Medical Science, Osaka, Japan. 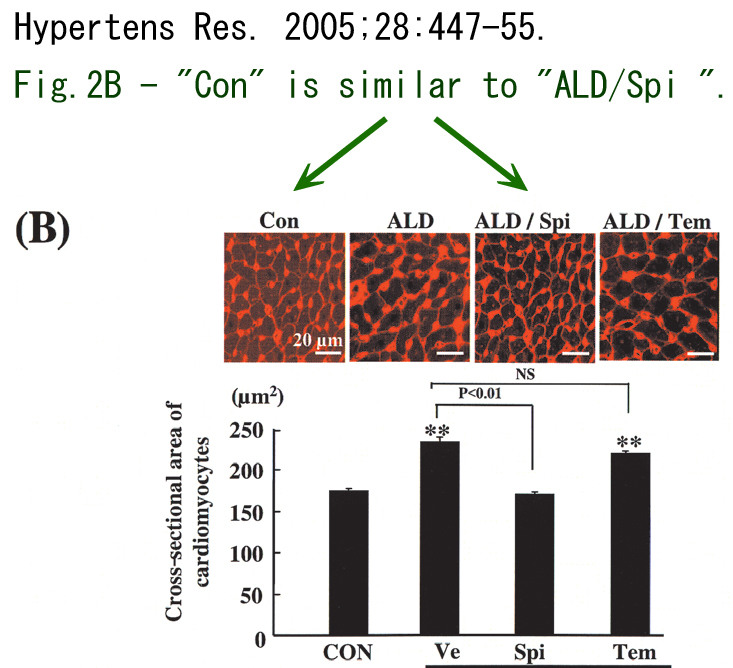 Fig.2B - "Con" is similar to "ALD/Spi ".